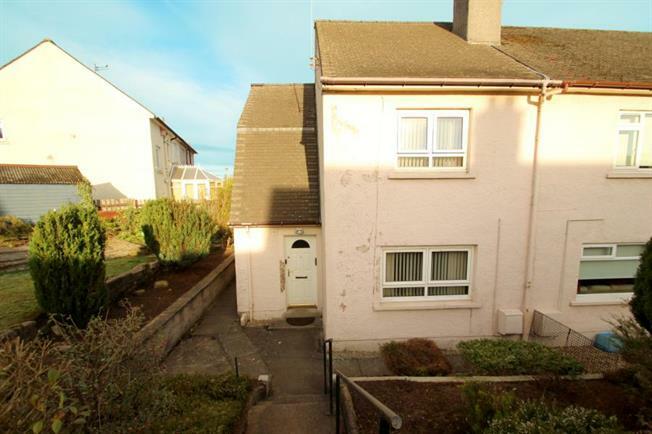 2 Bedroom End of Terrace House For Sale in Paisley for Offers Over £130,000. A seldom available end terrace villa situated within the ever popular Ralston locale. The property enjoys an enviable quiet cul-de-sac setting and sure to appeal to a variety of discerning purchasers. The accommodation has the potential for development to the both the side and attic aspects of the property with the existing interior comprising of a welcoming reception hallway leading into a spacious front facing lounge. Access to the modern fitted kitchen is from the lounge and adjacent to the kitchen is additional storage and access to the substantial rear garden. On the upper level there are two well proportioned double bedrooms and the family bathroom. The specification of the property extends to gas central heating and double glazing. Externally there are good sized and well maintained garden grounds incorporating a driveway for off road parking with the possibility of constructing a garage on the land subject to any planning/building restrictions. The superb setting allows easy access to local Ralston and Paisley facilities. Destinations further afield can be accessed via both public and road routes. The area is also renowned for excellent schooling. This property represents an excellent opportunity to acquire a family home within a sought after locale and early viewing is highly recommended to avoid disappointment.